The Lions took a real nice nosedive over the last few weeks, and they can kiss the playoff goodbye. Additionally, the Packer’s tie against the Vikings, while sad on its surface, was actually good, as it boosts them past the Lions. The Bears are in the driver seat, but we can all just agree the NFC North is pathetic. Speaking of sad against the Vikings and pathetic in general, the NFC East! The Eagles could have put away the division, but nope. And yet, they hang onto the East as well as the three seed, thanks to the sadness and patheticness (that’s a perfectly cromulent word) of the Bears and Cowboys. Over in the AFC, the big Ravens/Dolphins dogfight continues. This is a big week, since the Ravens play the Pats while the Dolphins draw the festering corpse known in most places as the Buffalo Festering Corpses. If the Ravens survive the Patriots, they close the season with the Bengals, who could actually be fighting for the two seed and a bye (again, assuming a Pats loss in week 16.) But the Dolphins still have the Jets, so despite the Ravens having the tiebreaker, the odds are in favor of the Fins. There are some longshots out there. 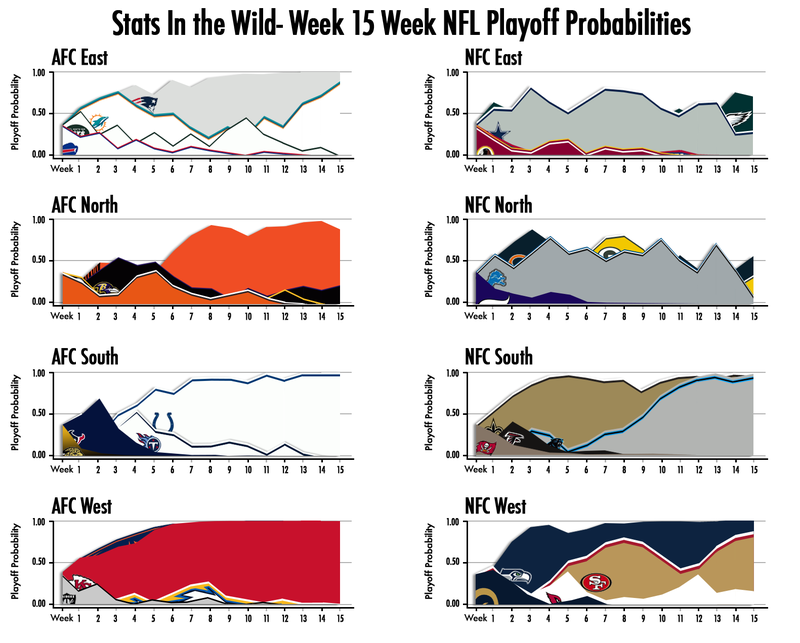 You can see from the chart, the Steelers and Chargers still have a chance, tiny though it may be. Likewise, the Cardinals, Packers, Lions and Cowboys are still alive. All of these teams need a lot of losing to take place to stand much of a shot, but they could feasibly sneak in. This is what we all love about the NFL: mediocre teams playing out the string, hoping for other mediocre teams to lose! Catch the fever! Posted on December 21, 2013, in Uncategorized. Bookmark the permalink. Leave a comment.